Starry Skies is brought to you by Kambe Events Ltd – the team behind the award winning Shambala Festival. This gloriously mucky hybrid between a festival and a family camping holiday is now in it’s 7th year – and is designed especially for free range kids and their grown ups. “THIS IS EVEN BETTER THAN MAJORCA!! !” – Anonymous but very vocal tiny human, 2017. A four day escape from emails, social media and the constant-pressure-to-buy-stuff-you-really-don’t-need. Never been before? Here’s what to expect. This is a family camping holiday with a difference! 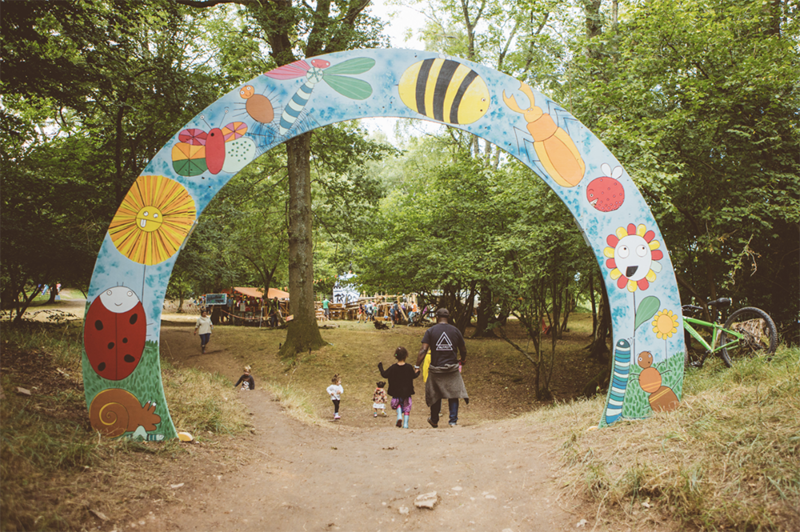 Our beautiful campsite is based on a family farm, in the Welsh village of Usk, complete with rolling meadows, ancient woodlands and even an iron age fort. Our huge, rustic barn is home to a well stocked bar, stocked up with local ales, cocktails and delicious wines, and plays host to stonking musical performances from bands and DJs by night. Starry Skies is capped at just 250 families – no scary crowds here, so you can relax in the knowledge your kids are never too far away. We’ve got activities coming out of our ears, all designed to get your kids running wild all day. A giant build-your-own-adventure-playground? Check. A mud kitchen that would put Mary Berry to shame? Check check. Forest School sessions for all ages? Absolutely. A GIANT legendary water slide? Duh. Have a nosy at what’s been confirmed so far for Edition Seven, here. Check out our full on-site facilities HERE. Not sure about what to bring? We’ve put together a handy list for you HERE.